The Bauhaus, founded in Germany in 1919 by architect Walter Gropius, had a profound influence in every area of design, from graphics and typography to clothing, furniture and architecture. The institution was not so much a style as a method, its philosophy based on the idea that if something is well-designed it will be beautiful of its own accord. The means to this end involved the founding of an art school where every student was also a tradesman, and every tradesman was also an artist. The Bauhaus manifesto expresses Gropius’ desire to unite the trades and the arts that their works might possess the grace of an inseparable marriage of function (design) and form (beauty). Today, the Australian government’s carbon tax repeal bills cleared Parliament’s lower house. They will be voted upon in the Senate next year. To see this reported as an act of climate vandalism by the media isn’t a surprise. What is surprising is the consternation of many Christians. The narrative of the Bible is fairly linear until we get to the kings. But once we hit the prophets the Scriptures turn into a box of puzzle pieces. The literature of the kings used Mosaic symbols to a certain degree but the prophets took all the concrete things we learned from the priests and kings and used them to make amazing promises that never quite materialized. Or did they? Most of the feedback I get is criticism, which is helpful for me — so it’s great to hear from someone who has been helped in some way! 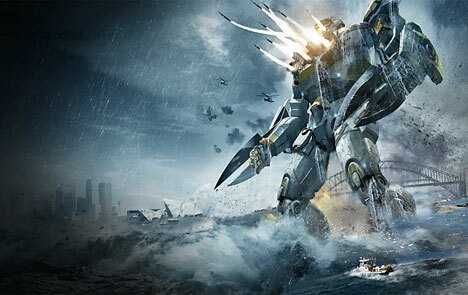 Just a few notes on Pacific Rim, a movie which we enjoyed very much. It’s one of those films where you know your strings are being pulled, but they are doing it so well you don’t mind at all. There are some interesting deviations from the Hollywood formula, and they are worth identifying. One interesting facet of biblical symbols is their identification by “use” and “motion.” Objects that have no link in the natural order of things can be tied together through their use in a similar purpose in the work of the house of God. This is not entirely strange. Diverse things which have no relationship in the natural order are brought together by man for use in “housework.” For the Author of the Bible, nature is “plastic.” This factor is one reason why the Bible is strange to modern ears and minds. Pushing something to its logical conclusions is most often a wise thing to do. If you have good data to start with (unlike those pushing global warming) the resulting “computer model” can be very helpful. This is also the case with biblical doctrine. It is very helpful to push hyperpreterism to its logical conclusions, which damn it entirely. It is also very helpful to push biblical typology to its logical conclusions. This may sound harebrained to some, but if done within the constraints the Bible itself gives us, false doctrine should stand out like blood stains under ultraviolet light.